1. Can We Save the Tiger? 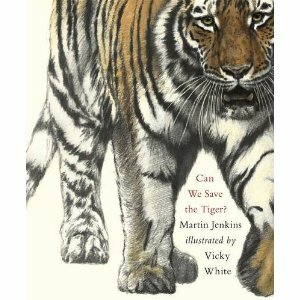 I am in love with Can We Save the Tiger? by Martin Jenkins. The illustrations by Vicky White are top notch! Amazing compositions and detail, that is what attracts me to this book so much. The text is filled with informative, yet developmentally appropriate information about endangered and extinct species. Tigers are pretty special — and so are ground iguanas and partula snails and even white-rumped vultures. But these and many other animals are in danger of disappearing altogether, joining the dodo, the marsupial wolf, the great auk, and countless other animals we will never see again. Using the experiences of a few endangered species as examples, Martin Jenkins highlights the ways human behavior can either threaten or conserve the amazing animals that share our planet. Vicky White’s stunning portraits of rare creatures offer a glimpse of nature’s grace and beauty — and give us a powerful reason to preserve it. I am really enamored with this book! We get a lot of children’s literature sent to us to review, and most of it is just downright stupid. Why authors and illustrators don’t honor and respect children’s intelligence is beyond me. Just because you are trying to deliver an environmental message to a young person does not mean you need create silly creatures and story lines that befuddle the message. Can We Save the Tiger? is a breath of fresh air in this genre! Would I buy this book? ABSOLUTELY YES! What I don’t like about these DVDs is I fear that parents may think that they can replace actual reading to their children by playing a DVD. Nothing can replace shared reading between an adult and a child! That being said, I did show this DVD recently while substitute teaching to fill in the gaps of time while I cleaned up art projects. My two favorite stories are Players in Pigtails and Swamp Angel. Players in Pigtails is about women playing baseball and is a great story to inspiring girls. It’s message is that girls can do anything boys can do just as well and is based on the historical formation of the All American Girls Professional Baseball League. Swamp Angel is of the classic American genre of tall tale. The kids were laughing out loud at this story, and I found it very entertaining. Would I buy this DVD? No. 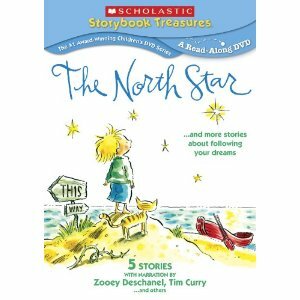 I would rather read children the stories than put on a DVD. Plus, there is nothing eco-friendly about this product. It comes in your standard plastic DVD case instead of recycled cardboard. A must have item for Moms On-the-Go! No more spills in the car, at home, or while traveling. Innovative drink sleeve prevents little hands from accidental squeeze, expands to hold multiple types of drinks and folds down for compact storage. 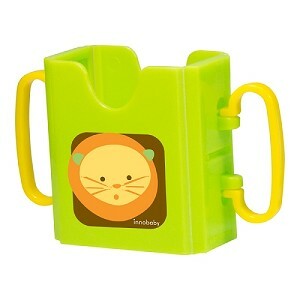 Great for giving a little helping hand for toddlers learning how to drink with milk boxes, juice boxes, juice pouches, kids water bottles, and small cups. Perfectly sized handles make holding easier for the little hands. Space saving folding design collapses for compact storage. Unique snug design keeps drinks in place. “I belong to…” name holder on the back side. bpa-, phthalates-, PVC and lead free. Oh, the accidental squeeze…I forgot about that one! I used to always take the first sip off a juice box to prevent it. This product is made in South Korea. Would I buy this product? Probably not. It is not too expensive at about $6, but I don’t really see it as necessary, and it is plastic, which I think best to avoid all together, BPA-free or not. It is an innovative idea, but part of greening family life is learning to live with less. Simplifying parenting means less paraphernalia. One of my favorite t-shirts from past reviews came from Rain Tees. It is super soft and comfortable, so much so that I love to sleep and backpack in it. I’m am pleased to report that three years later, Rain Tees is still making fashion “from rainforests to runways”. Beth Doane created Rain Tees in 2007 when she realized just how toxic the fashion industry can be for the environment. Beth had already developed Rain Tees’ parent company Andira International at age 22, where she focused on launching, importing and distributing exclusive European brands to the United States market. The word “Andira” describes a tall tree which grows in the Brazilian Amazon and has been used for centuries by indigenous people for its medicinal properties. However, due to logging, oil drilling and agricultural expansion in the Amazon, the species has become nearly extinct. As a result of this devastation, Beth wanted to launch a line that would educate consumers on critical environmental and social issues, end the negative effects of climate change, and not cause further damage to the earth in the process. When she realized that no such brand existed, she established Rain Tees. Andira Rain Tee donates art supplies to schools in Central and South America. 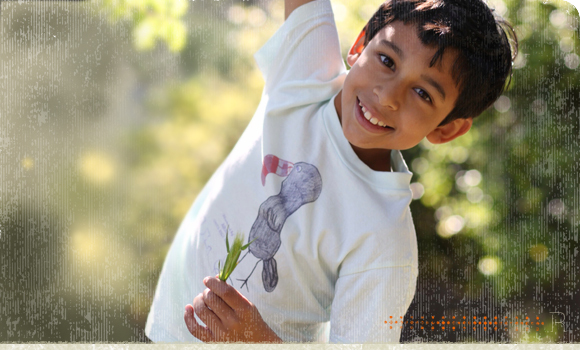 Children create designs that are chosen for these eco-friendly shirts. Then, Andira Rain Tees sponsors the children whose design was chosen, as well as use ethical manufacturing practices creating positive jobs in the Amazon region. Over 300 species of hummingbirds live in Central and South America and scientists predict there are still many species that have yet to be discovered. The Hummingbird Rain Tee was designed by Luiz Alvarajo. Because hummingbirds use so much energy beating their wings up to 100 times per second, they must consume several times their body weight in nectar each day. Luiz illustrates an Amazon Hummingbird doing just that. Would I buy this product? Yes. $32 is more money than I would normally spend on a child’s t-shirt; however, purchasing this unique item is also like making a donation and supporting Amazon families. “Fair Trade” helps “free trade” work for the poor. A 501 (c) (3) nonprofit organization, Fair Trade USA is the leading third-party certifier of Fair Trade products in the United States. We enable you, the consumer, to make a difference with your dollar. We help people and the planet work in tandem so both are healthy and sustained. We provide farmers in developing nations the tools to thrive as international business people. Instead of creating dependency on aid, we use a market-based approach that gives farmers fair prices, workers safe conditions, and entire communities resources for fair, healthy and sustainable lives. We seek to inspire the rise of the Conscious Consumer and eliminate exploitation. Fair Trade USA has an excellent fair trade gift guide, of which we were sent the following delicious chocolate treats! 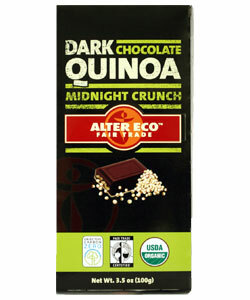 I am in love with Alter Eco’s Dark Chocolate Quinoa Bar. It is my favorite chocolate! I first tasted it after a strenuous backpacking trip, and well, it was divine! The quinoa crunch is perfect, and speaking of quinoa…the Sunspire baking bar makes the best quinoa brownies! You really can’t go wrong with Fair Trade chocolate! Would I buy these product? Absolutely Yes! I do all the time!